Hello everyone! Another rough couple weeks essentially devoid of hobby output, sad to say. I was able to squeeze in an hour of build time and I set to building what was originally planned to be a Master of Signals model for the Iron Hands. Since that never entirely coalesced, I figured I'd repurpose him for the Thousand Sons! I found out after adding him to the army list that a Master of Signals isn't actually allowed to have a combi-weapon. However, after flipping through the options I noticed that the Siege Master also carries a nuncio-vox and is allowed to have the modeled combi-plasma. 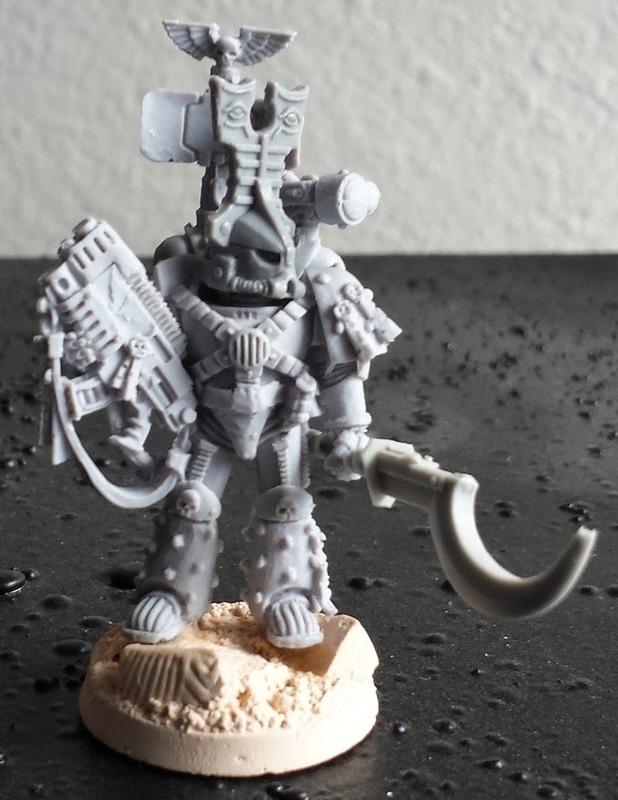 Simple head swap and the addition of a khopesh-shaped power weapon and job done! Had never considered the Siege Master for the Iron Hands as they didn't have a heavy weapon squad, but in the Thousand Sons granting Tank Hunter and Wrecker to the missile launcher team? Oh my yes! Another belter. I love any conversions where the model isn't in a battle pose. Nice work! @Zab: Hah! It has been a while - my usual steamroller method of army building has been severely disrupted with all the Real Life(tm) stuff going on. Boo! @Colonel Scipio: Cheers! I'm all for dynamism in models, but sometimes a nice calm and contemplative pose is just what's needed! Love that source model and love your conversion on it! He doesnt need to be shooting, he's planning the next step in the siege. Love the mk v armour with the 1k sons head. He looks a little skinny for some reason! Loving the conversion. How did you make the base? @Dai: Indeed! I dig the contemplative look. @Raymond Tan: Aye, that's partially due to the angle of the pic, but the elongated helmet and backpack does make him seem tall and spindly. @The Man In A Hat: Thanks! The bases are made from dental stone and come from ebay seller named eveonlineseller. They're heavier than resin, but seem a little more brittle. Overall I prefer resin, but these are an interesting change!